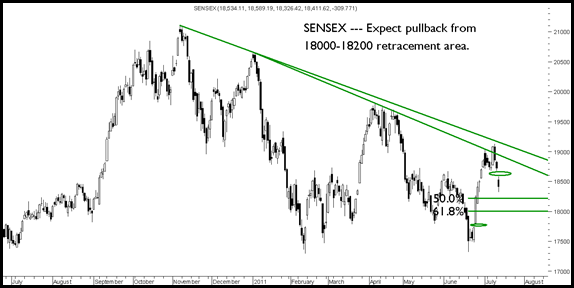 - > The volatility has increased in the index and yet again Sensex found resistance at the trendline. - > The drop has been sharp as before but what we see is contraction of the falls. If the current downmove is not able to break 17500-17700 in 2-3 weeks then it could be first signs of markets having bottomed out. -> The upmove took around 3 weeks from 20 June to 8 July. For a confirmation of a strong bear market it should break 17300 well before the end of the month or at least cover the gap left at 17754 levels. - > Technically there are good indications that the Sensex should find some pullback at 18000-18200 levels and any further crack in this month has strong support at 17700 levels. - > Again would re-iterate the bullish view and for us an index safe entry point is at 18000-18200 and 17700 levels. For the current scenario will stick to specific stocks. -> In the last few weeks there have been many index constituents or mid to large cap stocks which have outperformed so there are lots of short term opportunities. The general trend which i have seen is market tends to make important bottoms around fibonacci months and thats one of the reasons we could pick the major bottom in March-April 2009. So right now June seemed to be around 8 months from peak. So expect a major bottom to be in place already or by 1 month more. Else the next time zone could be 13 months which would be year end. - > The current market condition is a consolidation of a correction after the good rally from 8000 to 21000. My personal view is the major part of the price correction is over unless 17k breaks. Now its about a time wise correction. - > Stick to finding opportunities as my personal feeling is post a few months of such consolidation there could be some super stock specific moves as well as index. Its the time to research then to predict !!! - >My personal view is Sensex should hold above 17000-17300 on downside and may not cross 19800 levels on upside in a hurry for a few months. But the under-tone remains bullish and continue to buy on dips and sell on rise. Above all at some point of time in next few months its going to be a clear Buy and Hold market for long term. -> Review point for bullish stance is if 17k is broken which i dont expect. On the upside would be surprised if 19800 goes but that would turn the markets to be real bullish. BOTTOMLINE ---- This is the time to research find fundamental turnarounds, value picks, Invest slowly and time to create a portfolio for the long haul. Everybody on the street is not positive , Broader market is close to 2006 levels, Various Global Concerns, Rising Interest Rates, Falling Stock Prices, High Inflation,Falling Earnings, P-E Contraction, Political Reforms Paralysis and so on --- But what i see is opportunities come only in this scenario. The next few months will open up opportunites so dont be scared on the street but be prepared 🙂 --- Next few months will be the best time to create a long term portfolio --- START TODAY !! For silver i believe its time to focus on gold if you are a trader. Hi nooresh sir, i think if it is 5 wave bull market then 1st wave end at around 5100 level 2nd (complex with less price correction & more time wise appr. 1year) 3rd end at 6339 & 4th may be ended at 5196. This is sharp correction but not overlap 1st wave. So end of 5th wave may be around 6700 like levels (3rd cant be shortest) its also matching with complex correction A ended at 2250, B will make new high trap more bulls for wave C On longer time frame. Global fundamental story is singing the same song. Dont know what types of problem will occure may be bond bubble or currency crises. Your view please…. I would also suggest you do a deeper analysis on data from 1980 will give u a different perspective. Technically my view is simpler 17k is a base below which all probabilities go for a toss in short term. For me i remain bullish in long term . Short Term Sideways. Medium term 17800-19800 which if broken will give the next direction as of now. But time to look for stock specific opportunities.